That’s right, it’s already Fan Friday! This week went fast, didn’t it? This contest has ended. Check in with this blog every Friday for a new Fan Friday Giveaway! *Contest is open to residents of the U.S. and Canada and runs from May 31 through June 3, 2013. I would love to try this!! Thank you for the chance. This is one of the few masks I haven’t tried — but I definitely need to. I adore these products so much. Bring on the enzymes, please! I’ve only tried the sample size of this. It works great and smells wonderful. Would love to win a full size. My skin needs a rescue! I’ve been looking at this and thinking about giving it a try. I love the other enzyme products. I had a facial years ago at the spa in NYC. It was wonderful. I would love to win this product! I’d love to try this mask! My skin is super dry and always needs a boost. Thanks for the giveaway! Love all Mario products, haven’t gotten the chance to try this one. Would love to! Definitely want to give this a try ! have never used the enzyme products….would like to try it though. I am new to your products and LOVING them so far!! Would love to try something new. Thanks for the chance!! Would love to try this one!! Y’all have great products! I’d love to try even more. I want to win! Just ordered my MB beloved skin care essentials but I could definitely use this! I am a new client with this line and I would love to try this product. I would love to try your product. My skin is “mature”, and it can always use something to make it glow and stay youthful. Never enough Mario Badescu – never met a MB product that I didn’t get some benefit from! I LOVE Mario Badescu products and any opportunity to try something new is great. I love masks and would love to try this one! Thanks Mario Badescu for the opportunity! I have very dry skin and I have used numerous face masks hoping to add moisture to my face. I still haven’t found a product I can’t live without. Mario Badescu has amazing skincare and from what I have tried of their products, I have loved! Thank you for this opportunity to win! I was introduced to your wonderful products via instagram. So far I fell in love with the Glycolic Foaming Cleanser. I would love to try this product. Thank you for making your products affordable, yet high quality. OOhh and thank you for the chance to win a great prize. I would love to win this mask!! Haven’t tried it yet but I love Mario Badescu products!! I love your products! I finally found something that works! My skin could use some glow and revitalizing for the summer! Would love to try this!! I also think you all should integrate Facebook commenting on these blogs to further integrate social media on Fan Fridays! I neeeeed a new mask 🙂 Love everything! Would love to try this! I live in the whitening mask!!! This is my favorite mask from MB. Leaves my skin feeling sooooo soft! Love it… Crossing my fingers! Love everything I’ve tried and would love to give this a go! Mario Badescu has the best skin care products ever!! The only products I use!!! This is something I could use, since I spend some time every day outdoors for my job. Really need to get clearer skin! I love all of Mario’s products, especially his Lip Wax. Would love to win a product. Looks refreshing! I would love to try it! Love MB enzymes….haven’t tried this one yet! Just started my new skin care routine with Mario badescu products! Would live to add this one!! Wish I had some of this today. I’m celebrating my 1 year anniversary! Big plans for a special day. Collection. I’ve only had my products for a week and I’m already buying more. I am obsessed! Love this stuff! Great for skin that’s super sensitive, like mine tends to be! I’ve been searching for that coveted glow for quite some time and I would love to try this mask! My dull and dry winter skin is ready for some summer love! I absolutely love this mask! It works wonders on my red sensitive skin. It helps clear up any breakouts I may have while rejuvenating my skin and making it feel super soft! I would recommend this mask to even the most sensitive of skin. I would love a chanc to win this! Mario Badescu products are amazing…good luck to everyone! Happy Friday!! loving my rosewater facial spray! I would love to win! Mario Badescu has the best contests! I’ve recently become obsessed with my skin care routine after adding Mario Badescu to the mix, I would LOVE to try this mask! I would love to win this!!! I need it in my life!! i bet i would love this as much as my other MB products! I would love to try a new mask! I love Mario Badescu products and tell all my family and friends the products they should use too! Amazing stuff!! This mask is not meant for my skin how ever it would be nicw to win so i can give it to my mom. I know she would love it! I want to try the Enzyme Revitalizing Mask! The enzymes sound amazing! Since I have mature skin, I know this would be so beneficial to my skin and stop the dullness that has decended. This IS one of he products that I’ve never tried, and I would love to! I love everything I’ve ever bought from you! We love to try this mask because I think it is a very good product. I love enzymes…. very effective! Would love to try this Enzyme Mask! my old skin could use a boost. For some reason I can only use your enzyme products on my back, but I can’t even begin to explain how beneficial this line has been to my backne! Love using this after my skin has some hiccups (breakouts, dry patches, etc) from sweat, stress, and everything else. This mask has really helped my skin and I’d love to be able to have a full sized version of this product! I would love to have this! Mario Badescu has the BEST products! Thank you! OBSESSED with my MB products and would absolutely love to try this one!!!!! This Enzyme Cleanser is my favorite everyday cleanser so would love to try this mask to go with it. I have tried this mask before and I just love it. My skin thanks you in advance if I win! Thanks for the chance to win.. I would love to try Enzyme Revitalizing Mask. Looks like a great product, i would love to try. i love doing masks. thanks for the chance. Interested in trying this – awesome sounding product! I use the Enzyme Cleansing Gel on a regular basis and love it so it would be awesome to use this product in conjunction with the cleansing gel 🙂 thanks for a great giveaway! 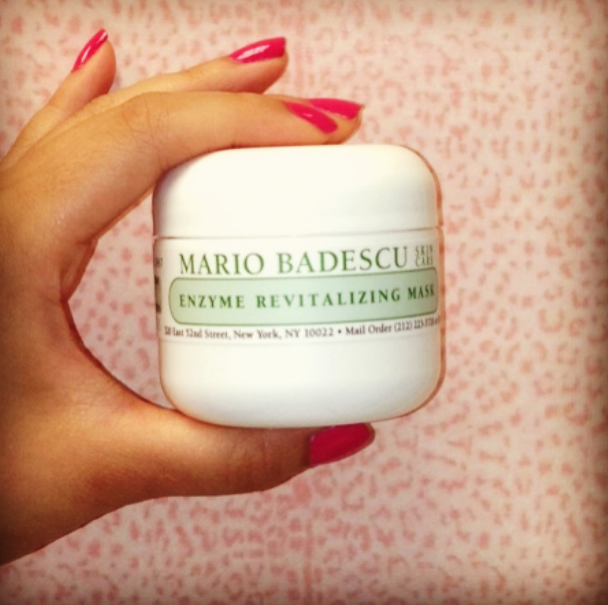 My skin would die without Mario badescu! I looooooove Mario badescu! And I would loooooove this product! I would love to try out this product!!!! Love and need it so badly! Hope this time is my chance to win this wonderful product. Just went to ULTA on Wednesday this week and purchased another $60 in your products but did not get this product. Thanks again for making my skin look wonderful! I could use a boost. I admit to being somewhat of a mask junkie…probably my favorite part of my skin care routine! I always love trying a mask that gives my skin a beautiful glow! I would love to try this. My skin often looks dull during the transition to warmer weather and I think this mask would help immensely! This enzyme mask would be the perfect way to say good bye to my dull winter skin and kick start that beautiful warm summer glow! I have never used a mask for my face before. I would to try this product that many people say nothing but great things and experiencing amazing results!! I am completely obsessed with the way Mario Badescu’s Enzyme Cleansing Gel makes my skin glow! Would love to try this product to complete my routine! Being a woman that just hit her fifties, the Enzyme Revitalizing Mask would be perfect to add to my skin care routine, making my skin brighter while exfoliating my skin. I would love to try this! This mask does wonders for my skin! This mask sounds delightful ! I would adore winning this!!! My face needs this <3 you guys!! Such an awesome give away! Crossing my fingers and good luck everyone! My skin has been a bit dull lately. I would love, love, love to try this! I would love to win – thanks for the opportunity!! My wife would love to win – so I thought I’d help her out too! Looks like a good one to add to my Mario-mask rotation! I would love to win so I can try it! Love all your products I’ve tried so far and would love to add this. I have terrible skin. My skin used to have WAAAY too much acne, pimples, and blackheads. I cleared it up though, but now my skin is all dry and dull. I would LOVE to try out this product! I am somewhat new to MB products but they have changed my life for the better! I have even told my dermatologist to recommend these products to her patients. I would love to try this mask! I’m someone who by gentic disposition has always had dry skin and I must say that I’m loving this Enzyme Revitalizing Mask. I love how the natural ingredients of papaya and grapefruit makes my skin feel hydrated without feeling greasy after I use it and how it brings about a natural glow that I have never had before. I would recommend this product to anyone who experiences dry or dull skin you won’t be disappointed. I absolutely LOVE your products! They’ve done wonders for my skin! Would really like to try this product! There are so many great products I want to try!!! I got the calming kit for my husband (he needed the calming cream) I ended up using the rest of the items in the kit and LOVE them, I’m never going back to what I was using before. Now I just need to get the right products for my skin type. Thank you for the awesome giveaway! If this works as good as the Enzyme Cleanser, then I HAVE to get my hands on it! Being on a strict monthly income only allows me to buy when I absolutely have to! A full sized freebie would rock! I just bought your seaweed soap and toner yesterday and I love them! I’d love to try this. I love Mario Badescu products. I would love to win this. Love MB product line! Would love to add this to my collection! Yay for 30s skin! HA! my skin would thank you for heloing it heal from the 20s =) You live and learn. Love MB. Really want to try this to give my skin a boost of GLOW! Just started using your skincare and I’m in love!!! would love a chance to win this and try other products as well!! Looking for a new product to add to my summer skin care regimen! Sounds like a winner! This is my favorite MB mask and always my last step when doing at home facials. It leaves my kin feeling so smooth and soft. I would love to try this mask. I started using the enzyme cleansing gel and in a couple of weeks i noticed fewer breakouts and such smoother texture than I never knew I was missing! I loved it so much I told my mom an out it and she is also loving MB products. Thank You! I have the Drying, Whitening, and Healing and Soothing masks. I absolutely love all of them! I would love to try the Enzyme Revitalizing mask too. Your products continue to amaze me! I tried a sample of this mask, and it was amazing! I was going to buy it as a gift for my mom, but a free tub would be even better!! I love this and wish I could win something just once in my life!!!!! I would LOVE to try this ! I have heard such great things about your line! I love Mario Badescu!!! Would love to try this product!! I really need this mask. i was just at ulta today looking at MB! Would love to win! I am a fan of your skin care products my skin has changed so much since I started using them. I would love to try the enzyme mask. Sounds like a product I could use. Can’t wait to try this product!! I’ve been able to try a couple products for your line, but I would love to gift this to my Mom! Love your products, definitely want to give this one a try!! This is my absolute FAVORITE mask. I love how it makes my skin feel super smooth and moisturized. The smell is nice too! I rave about this mask so often that my cousin even went and bought her own after using mine. BEST MASK EVER! I love this skin care line! I would absolutely love to win this! I love Mario products and would love to win the mask!! my skin could do with this!! Sounds like just the ticket for my aging skin….would love to win this! Great opportunity! It seems I’ve missed this amazing gift:(! Who’s the winner and when we can have another chance? I know that papaya contains an enzyme papain and it’s useful for removing dead skin cells. Like other citrus fruits, grapefruit also has a cleansing and toning effect on the skin. It is particularly good for oily and pimple prone skin. Great combination in this Enzyme Revitalizing Mask!